We know how the male-to-female ratio breaks down globally, because of a beautiful-looking map highlighted by Reddit earlier in the week. But how might that a similar map look broken down into much smaller pieces inside the United States? Robert Chase is glad you asked. 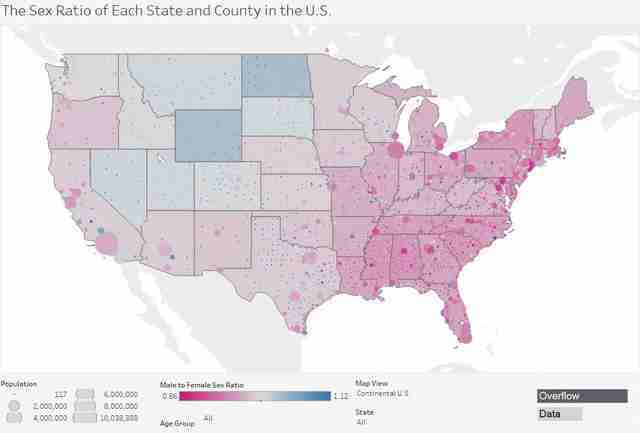 Inspired by the Reddit thread that highlighted the aforementioned global map, he’s created a similar map using census data from 2011 to 2015 to show the male-to-female population distribution breakdown across the United States. As we saw in the previous map, the U.S. has slightly more female residents than male residents, but not at the extreme rate seen in Russia and other former U.S.S.R. states. So it's not surprising that the majority of the states appear to have ratios below 1.0, where 1.0 represents an even distribution and numbers below that indicate a heavier female population. 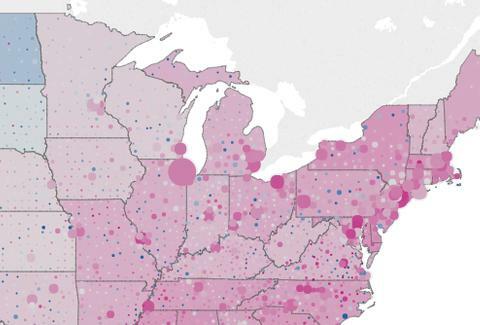 Break it down by American citizens over the age of 50 and the map basically turns hot pink. Some areas, like the Bronx, carry a ratio as tilted as 0.74 (74 males for every 100 females) and Kings County (Brooklyn) carries a 0.76 ratio. Take a look around and then go ahead and make your obligatory "Ay, I've got to move to X" joke.